The USDA’s organics program has been taken over by corporate interests; it’s time to fight back. Consumers looking for clean, healthy food have for years turned to foods with the USDA’s organic seal. This seal is understood to mean that the food has been grown in accordance with organic principles—most importantly, that the farming practices promote healthy soil, which in turn produces healthy food. Unfortunately, corporate influence has infected the USDA’s organic program to such an extent that it can be difficult to trust the organic seal. Concentrated animal feeding operations (CAFOs) have taken over organic eggs and dairy. According to organic standards, livestock are supposed to have access to the outdoors, fresh air, and sunlight. But these provisions have been interpreted in such a way as to allow CAFOs to confine animals to barns but add “porches”—a roof built over a concrete floor with screens as walls—and still label their livestock as “organic.” This allows CAFOs to continue to raise millions of chickens or livestock on the cheap in cramped, squalid conditions but charge the organic premium. 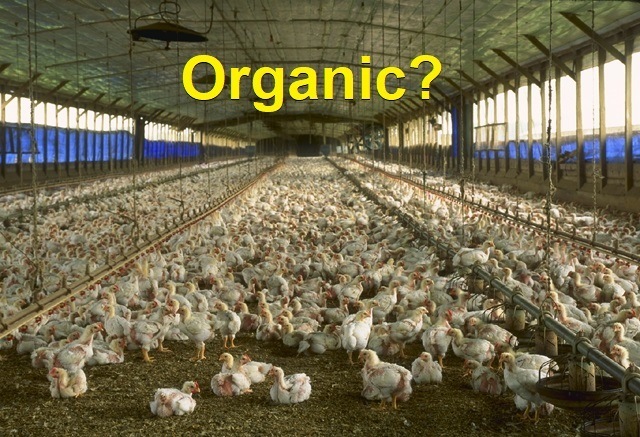 The USDA estimates that half of all organic eggs come from CAFOs. I agree with GG in the first comment. This is a horrific time in our country....Be vigilant and take back our soil. Share this and motivate others to go voice their pprotest. adults and animals including plants and trees.